Captain Patrick Reid whose family were from Carlow, Ireland was one of the few people to escape from Colditz Castle during World War II. 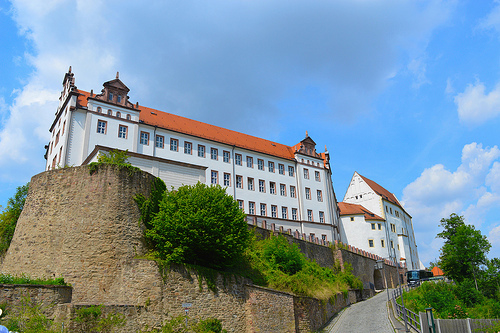 Colditz Castle, which is located in the state of Saxony in Germany, was used as prisoner-of-war camp by the Nazi’s during the war. Patrick Reid, whose father John Reid was from Grange near Tullow, Co Carlow was born in Ranchi the capital of the state of Jharkhand in north eastern India. He was educated Clongowes Wood College Co Kildare, Ireland and graduated from King’s College London in 1932. He later trained as a civil engineer. In 1935 Patrick Reid joined the British Army and was mobilised for active duty on August 24th 1939. Whilst serving as a member of the British Expeditionary Force he was captured by the Germans on May 27th 1940 near Cassel about 30km south of Dunkirk in France. He was sent as a prisoner of war to Laufen Castle in Bavaria close to the Austrian border. Three months later having dug a tunnel Reid and five other prisoners escaped and tried to reach Yugoslavia. They were captured within days and returned to prison. In November 1940 they were sent to ‘escape proof’ Colditz Castle, which is located in the town of Colditz, between Leipzig and Dresden. Following several escape attempts Reid and three others escaped from Colditz. Reid crossed the border into Switzerland in October 1942 and remained there for the remainder of the war. After the war Reid served for a time as a diplomat in Turkey. He was later appointed as an administrator of the Organisation for European Economic Cooperation (now the OECD) based in Paris. He also became a writer detailing his experiences as a prisoner of war and his escape attempts. Some of his writings about Colditz formed the basis for a film in 1955 and later for a series on television. He was made a Member of the Order of the British Empire (MBE) in 1945. Captain Reid died in Bristol in 1990 at the age of 79. Patrick Robert Reid was born in the year 1910 On This Day. One of the Third Reich’s biggest internal security problems was caused by a Grange Man.